The Semovente 75/18 M41 is a Rank II Italy tank destroyer with a battle rating of 2.0 (AB/RB/SB). It was introduced in Update 1.85 "Supersonic". The Semovente 75/18 offers little in the way of effective protection, with its primary defence against enemy tanks being its small frontal profile. the 50mm frontal plate struggles to keep out even rank 1 British and US guns at close range, while the extremely cramped interior means that penetrations will often knock out multiple crew members and modules in a single shot. Despite this, the Semovente's armour is still capable of keeping out machine-gun fire from most angles, and its fully-encloses design offers protection aircraft machine-guns unlike many of its low-rank open-top contemporaries. The Semovente is reasonably mobile for a low-rank tank destroyer, hitting around 30km/h on flat ground off-road with a fairly fast hull traverse and a poor reverse speed. The Semovente will struggle to be effective with the extremely poor penetration of its APHE rounds. With a max penetration of barely 50mm at point-blank range, the vehicle will have problems penetrating the angled front armour of many similar rank vehicles, with light-tanks, armoured cars and SPAA being the best targets. In a full up-tier, the Semovente will struggle to do any damage at all with stock shells, with the sole exception of light tanks and AA vehicles. In this case, it is best for drivers to attempt to flank and shoot enemies from the side, where the powerful explosive capacity of the APHE shells offer excellent single-shot knock-out capability. The vehicle's effectiveness improves massively once the HEAT shell is unlocked, with 100mm of penetration at all ranges. This allows for reliable penetration of practically all the Semovente's potential adversaries with the vehicle's most dangerous opponents being fast and agile light tanks such as the M22, which can easily penetrate the Semovente from close range and whose speed and size make a difficult target for the Semovente's low-velocity howitzer. 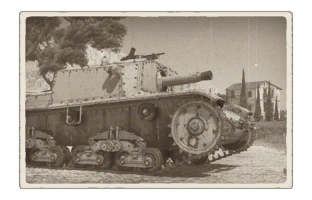 With the HEAT shell, the Semovente can make for an effective support vehicle, albeit one whose lack of survivability punishes positional mistakes harshly. The one thing to remember about the HEAT shell is that it sacrifices the one-shot capability of APHE, meaning that larger tanks will often take multiple hits to disable, and its even lower velocity makes its excellent long-range penetration difficult to exploit. The Semovente 75/18 was originally intended to be a self-propelled gun rather than a tank destroyer, with the War Thunder version being an improved variant built upon the M41 tank chassis with improved armour. In response to the poor effectiveness of existing Italian tank destroyer designs such as the 47/32 L40, the Semovente was pressed into service to combat US-built M3 Lee and Stuart tanks in service with the British Army in North Africa. Utilising a HEAT shell, the Semovente proved to be an effective counter to early-war British tanks, with its small size making it ideal for dug-in defensive positions where its lack of speed wasn't an issue. In one engagement in 1942, Semovente's of the Ariete Division repelled an attack from 40 British light and medium tanks, destroying 20 with no losses of their own. While the Semovente's HEAT shell proved effective against early-war tank designs, tougher Allied tanks such as the M4 Sherman represented a new challenge. This, as well as the Semovente's cramped interior, low-velocity gun and under-powered engine lead to the development of larger and faster dedicated tank destroyer designs with superior firepower. Skin and Camouflages for the 75/18 M41 in Warthunder Live. This page was last edited on 3 April 2019, at 16:12.